We recently moved across the country to California. A few weeks before our move date, my husband asked me to make new pillows for our new place. 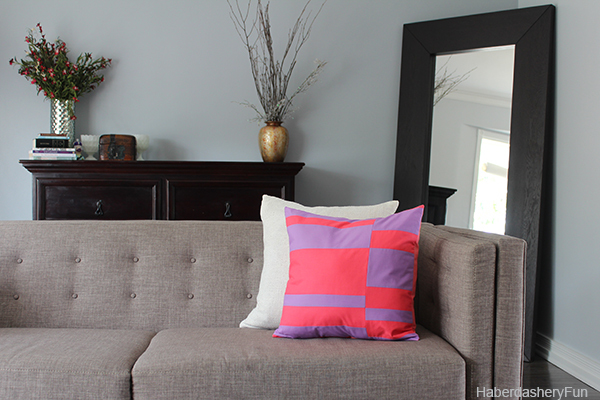 I love sewing, especially pillows and thought my husband’s request was a great way to add a pop of color to our new living room. 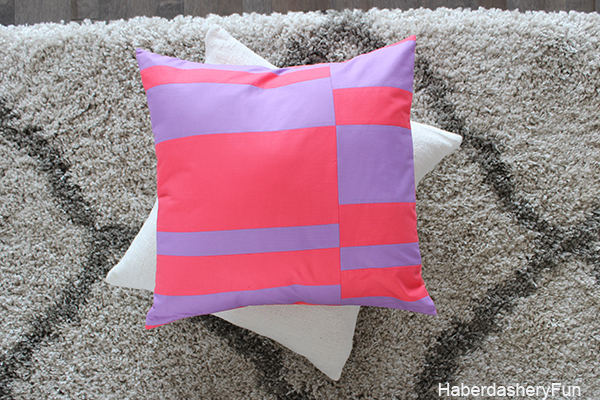 Want to sew pillows? 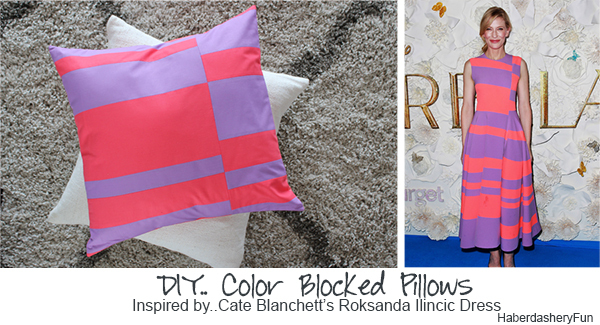 Well, I’m happy to be sharing a step by step tutorial for this bold, color blocked pillow over at the Hamilton Beach – Everyday Good Thinking blog. Hamilton Beach invited me to create a project using their new Durathon Digital Steam Iron. If you’ve been here much, you’ll remember that I’m a bit of an ironing freak and I press quite often in my sewing tutorials. So I jumped at the chance to try out their new iron. This iron is impressive – I LOVE LOVE LOVE the steam power and the retractable cord is so great! I also tend to leave my iron on and forget about it.. When you get busy sewing away, it’s a great feature to have your iron shut off on its own, right? AND GREAT NEWS.. Hamilton Beach wanted to give one of my lucky readers a chance to win a Durathon iron!! See below for more details. My pillow was inspired by the Roksanda Ilincic dress that Cate Blanchett wore at the Australian movie premier of Cinderella. The colors in her dress are bold, modern and oh-so fresh. What color combinations would you use? Make sure to pop over to see my step by step tutorial on the Everyday Good Thinking blog. It’s an envelope pillow, so you’ll be in full sewing mode in no time. I hope I’ve inspired you and happy sewing! A BIG thank-you to Hamilton Beach for supplying the Durathon Steam Iron that I used in my pillow project, as well as the iron for one lucky reader. As always, all opinions are 100% my own. I desperately need some new throw pillows in my living room to freshen things up. i would make my son some bear pillows for his bed. I love this super bright colour combo, and inspired by a dress – just goes to show inspiration can be anywhere! I’d definitely make some pillows! plus some tablerunners and placemats. I’d love to make some color blocked totes and baskets! I’d love to make a color blocked pair of pants for my teen girls (so fun!) Thank you for the giveaway. What a great pillows. Thanks for sharing the tutorial. I would make this pillow, or one like it!! I love it!! Love the pillows! Thanks for the chance to win! Love the colors and that print!